ATHENS, Ga. - Maybe Georgia's defense will be salty and unrelenting against everybody but the Buffalo Bulls. Georgia's seemingly biggest strength entering this season became its biggest disappointment in last week's opener, as the Bulldogs allowed 243 first-half yards before regrouping and pulling away for a 45-23 victory. The competition is much stiffer this week as No. 7 Georgia travels to Missouri to face the Tigers and their spread offense, and Bulldogs fans are wondering if last week was an aberration or a troubling pretense. "I feel like we were just dusting the cobwebs off," nose tackle John Jenkins said. "It was our first game of the season. We had a lot of young guys who played their first snap, and we had a lot of freshmen play. If they feel that they are worried, then just look for the next game." The Bulldogs were expected to blanket the Bulls, but tailback Brandon Oliver rushed 20 times in the first half for 89 yards, and quarterback Alex Zordich added 53 yards on six carries. Zordich finished with 83 yards on 14 runs, most of those occurring on designed pass plays. Georgia began dominating at the start of the third quarter, as Buffalo's first five possessions of the second half resulted in 18 plays for 19 yards. "Any time you have split-safety coverage and you're rushing four guys, there are six gaps for four guys, so it's critical that you collapse those pockets," defensive coordinator Todd Grantham said. "When you collapse the pocket outside in, you constrict that area. But if you create a seam in there, a guy can get out and make some yards, because you've got vertical separation between the rush going one way and the receivers moving down the field. "We've addressed it with the players as far as what they need to do, and we will continue to work to make sure that doesn't happen." The Bulldogs have players with multiple starts at every defensive position, but they played last week without linebackers Alec Ogletree and Chase Vasser, cornerbacks Sanders Commings and Malcolm Mitchell and safety Bacarri Rambo. Commings and Vasser were issued two-game suspensions before the season, and it is unknown whether any of the other three will play. Less-tested players such as cornerbacks Devin Bowman and Damian Swann and safeties Connor Norman and Corey Moore could be asked to slow a Missouri offense that ranked 12th nationally last season with 475.5 yards a game behind dual-threat quarterback James Franklin. "Any time you face a quarterback who can bide time to let guys get open, it's a challenge for you," Grantham said. "I think it's important that we all need to understand the game plan and understand leverages and fits and where you need to be. We need to play with energy and have fun. "They're entirely new for us and obviously have a formula for how they want to win the game and what they want to do." Grantham believes there is a misconception that Missouri prefers to throw from the spread. The Tigers had at least 37 rushes in every game a year ago, including 40 or more in each of the last 11. Henry Josey was 12th nationally with 116.8 rushing yards a game last November, when a severe knee injury knocked him out of the rest of the year and this season as well. Kendial Lawrence started in last week's 62-10 romp of Southeastern Louisiana and had 121 yards on 10 carries. The Bulldogs allowed one 100-yard rusher last season - South Carolina's Marcus Lattimore - but Buffalo's Oliver amassed 111 yards last week on 30 carries. 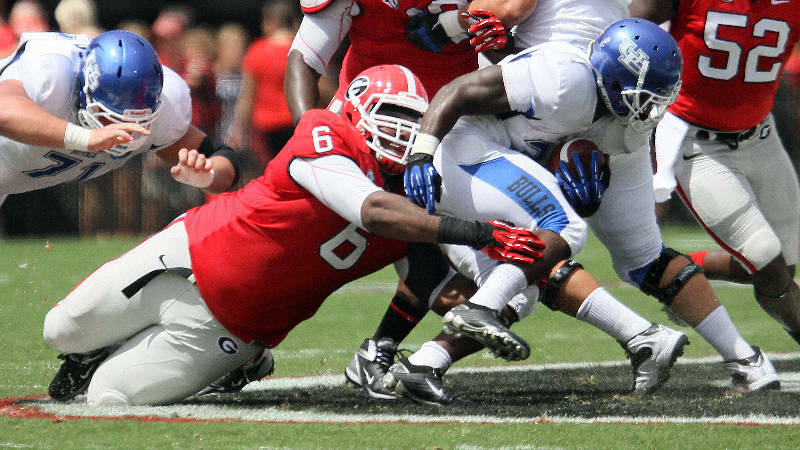 "We're not real interested in that happening very often," head coach Mark Richt said. "We can't just sit there and say we were really satisfied with how we stopped the run." So a youthful secondary has to contain Missouri's receivers, and the Bulldogs will have to slow what the Tigers do best -- run. "The running lanes are the big thing," inside linebacker Christian Robinson said. "They really want to spread you out, and there is so much distance that they're going to get their yards here and there. You've got to make a play when you have a chance." Said Jenkins: "If we do everything the right way and do everything as far as being in the right place at the right time, there shouldn't be a lot of running."